With summer on the horizon, Southern California waves are beckoning a slew of Angelenos, including a French bulldog who has made surfing her charitable hobby. Cherie, the 5-year old Frenchie, literally started from the bottom after being left at a dog shelter by a family who could not take care of her. Cherie was placed into the French Bulldog Rescue Network at a very young age. That's where she was rescued by a Newport Beach couple with great love for Frenchies. 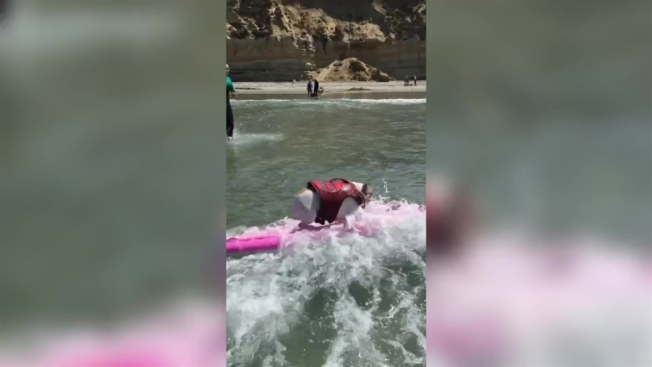 Under the care of Amy and Dan Nykolayko, Cherie made frequent trips to Rosie's Dog Beach in Long Beach where they saw how much Cherie enjoyed the water and wearing a life jacket. 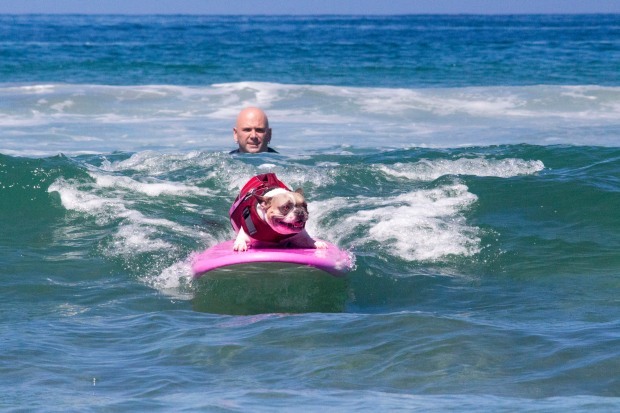 After her owners learned of dog surfing lessons in Del Mar, Cherie began her surfing career. In 2013, Cherie began competing, not only for her own, but for dogs across the nation. With the help of the Nykolaykos, Cherie has raised nearly $7,000 since 2013 for rescue organizations by participating in many canine surfing competitions. "Surfing is crazy, awesome fun but it is very important to me to help raise money for animals in need at all of the events that I compete in," reads Cherie's mission statement on her website. "Many dogs aren't as lucky as I am so I do my very best to give back every year." Cherie won first place in the medium dog category at the 2015 Surf Dog-A-Thon and has placed in many competitions for her fundraising efforts as well. She has appeared at the All-Star Dog Rescue Celebration as well as on Nightline and Good Morning America. The Nykolaykos, who do everything from coordinating Cherie's outfits to surfing alongside her, are both fundraising coordinators at the French bulldog Rescue Network where Cherie was placed before finding her forever home with them.